Last month, Microsoft launched the new Bing with a social sidebar that lets users ask friends for ideas and recommendations while searching. Now, Microsoft has added a new friend-tagging feature to Bing searches. You can now tag your Facebook friends when sharing a Bing search. Just enter a question or comment in the sidebar and type the name of the person you want to tag. 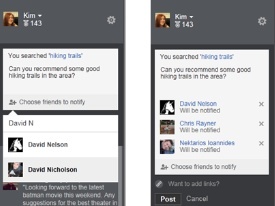 The feature allows users to tag up to five friends at a time. With your permission, your question or comment will be posted to your Facebook timeline, and your tagged friends will be notified so that they can help you find what you’re looking for. “This(new feature) allows you to effortlessly tap into the collective wisdom of your social network, and get input from your friends who are in the know,” Microsoft states in an official post on the company blog. Whether you are looking for good holiday destinations, restaurants located nearby, or searching for some general information – this new tool can come handy and help you gain more out of your Bing searches.